A day after Union Home Minister Rajnath Singh called for safety of the Kashmiris, the Congress said that it was surprising to hear that the former was saying obvious things. "I am surprised that Home Minister has to say obvious things. Of course, they are citizens of India. Jammu and Kashmir is part of India and its residents are citizens of our country. Young people who have come from Jammu and Kashmir for education and job, we must not let them feel alienated. 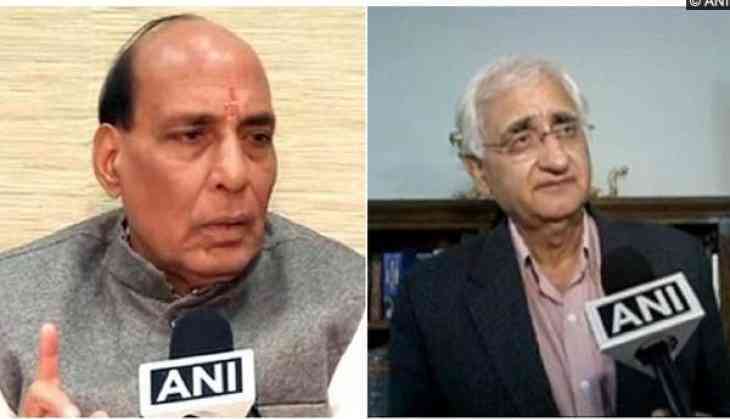 It is not in the national interest to let anyone feel alienated and uncomfortable," Congress leader Salman Khurshid told ANI. Backing Singh's statement Congress leader Tom Vadakkan said the freedom of every citizen should be protected which is to be ensured by the home minister. "You can't create a situation that particular student from any particular state cannot come to another state for study. I think complete protection of the Kashmiri students must be taken care of and no such situation must prevail in any part of the country. A citizen of India can travel and study anywhere and that freedom should be protected. Who other than the home minister would do it," he told ANI. In the wake of the Chittorgarh incident, where a group of Kashmiri students at a private university in Rajasthan were allegedly called terrorists and beaten up by the locals, Singh yesterday appealed to all the states to ensure the safety of the Kashmiris. "Last evening I got to know that some Kashmiri youth have been mistreated. I appeal to all the Chief Ministers to ensure that no Kashmiri youth is mistreated in any part of the nation. Even they are part of India. No one can rubbish this truth that many people from Kashmir are contributing to India's safety and prosperity," Singh told ANI. He said he has asked the Home Ministry to immediately circulate an advisory to all states in this regard. "The incident is extremely unfortunate and I condemn it. Strict action will be taken against anyone who mistreats any Kashmiri youth. I appeal to all the youth to consider them as their brother. They are citizens of our country and part of our family. The people should understand this reality," he added.